Rule 1: I never drink alone. Rule 2: I never drink when I am upset. Rule 3: I never drink my feelings. Rule 4: I never drink to stop feeling. I am writing this drunk. It is a thing few people would admit to. But a thing in which I have become accustom to. I am a 21-year-old alcoholic. I have known from a very young age that I carried the gene for alcoholism. Very few people know that there is a GENE for alcoholism. apparently these things can skip a generation. I have known that I was an alcoholic since I was 16. I wanted it all the time. I constantly crave that warm buzzy feeling that alcohol brings. I often feel cold and shivery when I resist the urge. There is a bottle of vodka that I keep in my closet. I keep it closed because as long as it is closed… I am winning. so far is that I know I have it. I need to drive to the grocery store, or to a friend’s house, or class, etc. I have been socially conditioned not to. is being an older sister to my siblings. more than I need to drink, is a motivator. and pictured my little sister’s face instead of the label. I have used autocorrect in this one article so many times already that I should be embarrassed.... But I am too busy sitting on my parent’s living room floor trying to make the world stop spinning. I know that I want people to read this, and I know that I am going to have to send it to Kellie (My Editor at HC Western Ontario), to get it published. I have had to decide what is more important to me: protecting myself or helping others... I will probably publish it anonymously and own up to it years later... I am not very good at keeping things a secret, and I am not very efficient at feeling shame. Shame is a foreign emotion to me. It took me a very long time to understand it. Shame is really a thing that other people impose upon individuals; it is not something we come to feel on our own. Shame is something that is taught to us so that other people feel more comfortable. I am an alcoholic. I have always known that I was an alcoholic. I sometimes love being an alcoholic. I love that feeling that sneaks up from my belly and wraps itself around my waist, climbing my spine with its warmth, muddling my brain. I have RULES about my alcoholism. I have rules because I haven’t much sought help and because I am not ready to tell anyone that I am an alcoholic. I made these rules a long time ago and I have stuck to them strictly, for protection. I realized in high school that breaking any of these rules was bad for me. I have broken these rules. Not recently; but it has happened. I think that the scariest part of alcoholism is that few people talk about it. I was lucky. My step-dad’s brother is an alcoholic and I saw first hand the damage that he caused his family. Fear is the thing that keeps my alcoholism in check.... Fear of hurting my family, fear of them finding out, fear of being seen as broken or faulty. I have sometimes wondered if this fear would disappear if I just told them that I was an alcoholic, as my love for my family is stronger than my alcoholism. It always will be, I tell myself. I tell myself that I can have one drink, it won’t hurt and I’ll be fine. The withdrawal for the next few days is excruciating, but less painful than the social ostracism. People my age do not understand alcoholism; they are too preoccupied with casual drinking. 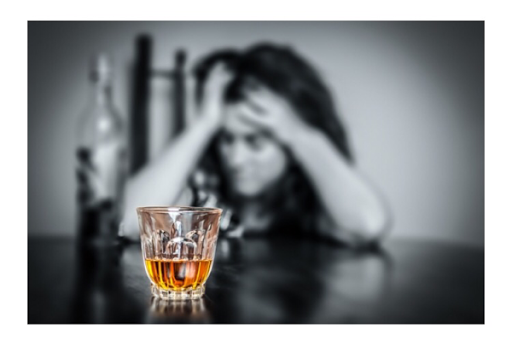 They associate alcoholism with older people, sadder people, more pathetic people with depression or something else. No. It isn’t necessarily associated with any of these things. I am not depressed; I am actually extremely happy and outgoing and indulge in a healthy social life. I don’t even understand the meaning of anxiety, as I am a very laid back individual. But I do understand the word addiction. I understand the belief that a substance can solve all of my problems, make them disappear and make me feel so good. I crave alcohol always, 24-7, even in my sleep. I have come to terms with this and I accept this. However, I am not ready to let people be privy to my struggle. But I will not let others feel alone. Addiction is an illness… can be genetic… can be developed… can be many things. But addiction only has the power that we give it. The biggest fear that accompanies addiction is that the addict is helpless before it. It took me a long time to realize that I was not, and that I could use that fear as a tool. I have made it my strength and my shield. It may not be the world’s healthiest protection, but it is protection. And I lend its use to anyone who needs it. I wish you luck and I send you strength. I hope that you know you are not alone. and look down at its fragments in satisfaction. Every morning I wake up and I refuse to give in. and I plan to do this for a very long time yet. Addiction will not own me. showing it pictures of my beautiful life.